We’d love your help. Let us know what’s wrong with this preview of Murder in the Queen's Armes by Aaron Elkins. The third novel in the Edgar Award-winning Gideon Oliver series--now with an eye-catching new package. No sooner do the anthropologist and his bride check into the Queen's Armes than a mystery gets underfoot at a nearby dig. A battered body is discovered instead of the anticipated Bronze Age relic. . . .
To ask other readers questions about Murder in the Queen's Armes, please sign up. I read "Murder in the Queen's Armes" on a recommendation to see how to handle writing the setting as an actual place. What I learned was, if you're going to write in an exact locale, make it EXACT, or else, fictionalize it. Someone will notice the inaccuracies and be distracted by same. In this book, because I've spent some time in Charmouth, England, I know you cannot walk up the Stonebarrow Hill and have Lyme Regis at your back to the East, it's West. I also know the correct name of the wateri I read "Murder in the Queen's Armes" on a recommendation to see how to handle writing the setting as an actual place. What I learned was, if you're going to write in an exact locale, make it EXACT, or else, fictionalize it. Someone will notice the inaccuracies and be distracted by same. This isn't a bad book—a fluffy little mystery—worth reading. Even on his honeymoon murder and mayhem follows! Great mystery. Anthropology and forensics fun and right on. Decsription of the area were very well done- followed on Google map. "Gideon Oliver, the physical anthropologist whose previous exploits have earned him (rather to his dismay) the title of the Skeleton Detective, is in England on his honeymoon. He and his wife, the delightful park ranger Julie, whom he -- and we -- met in The Dark Place, find themselves in Wessex near a dig being run by a former classmate of Gideon's, and Gideon stops by to say hello. When he arrives, he discovers not only that the always-abrasive Nate Marcus is in serious trouble and about to be "Gideon Oliver, the physical anthropologist whose previous exploits have earned him (rather to his dismay) the title of the Skeleton Detective, is in England on his honeymoon. He and his wife, the delightful park ranger Julie, whom he -- and we -- met in The Dark Place, find themselves in Wessex near a dig being run by a former classmate of Gideon's, and Gideon stops by to say hello. When he arrives, he discovers not only that the always-abrasive Nate Marcus is in serious trouble and about to be investigated by the foundations financing the dig, but that the local paper has mysteriously learned of Gideon's presence and linked it with the investigation. "The atmosphere at the dig is unpleasant; there is suspicion, professional and personal rivalry, and distrust among the archaeologists and graduate students working there. Nate claims to have found proof of a theory that is disputed -- indeed, scoffed at -- by almost the entire profession, and his refusal to reveal it to Gideon disturbs his friend. Then one of the students disappears, and when a body is found, Gideon is called upon to play Skeleton Detective once more. It's not a pleasant way to spend even part of a honeymoon, especially when Professor Oliver's activities lead to another murder and put not only Gideon himself, but Julies as well, in mortal danger." Professor Gideon Oliver is honeymooning in England and at the request of his mentor, takes a little time out to visit an old colleague. The colleague is sort of on the fringe in anthropology circles, claiming that "Wessex man" and their culture was a direct transfer from Mycenaean cultures in the Bronze Age instead of indirect transfer as the culture migrated across Europe. Despite his ideas, Gideon feels that Nate is still an excellent archaeologist and is interested to see what he's found on h Professor Gideon Oliver is honeymooning in England and at the request of his mentor, takes a little time out to visit an old colleague. The colleague is sort of on the fringe in anthropology circles, claiming that "Wessex man" and their culture was a direct transfer from Mycenaean cultures in the Bronze Age instead of indirect transfer as the culture migrated across Europe. Despite his ideas, Gideon feels that Nate is still an excellent archaeologist and is interested to see what he's found on his new dig. The dig is surrounded in tension as Nate claims he's found evidence to support his theory, and the others involved don't believe him while the two organizations that are supporting the dig are poised to investigate Nate's "unprofessional" behavior. When one of the dig workers is discovered murdered within hours of wanting to tell Gideon something important about Nate, Gideon finds himself becoming more involved that he wanted to. Nate's career and reputation are on the line. Other lives are on the line as well. Can Gideon figure out how everything connects before someone else is murdered? This is the third book in the series and with each book, I'm finding more to love about Elkins' writing style and his characters. Gideon and his new bride, Julie are wonderful together. I enjoyed the mystery as much as the anthropology and sort of figured out whodunit early on, but was still fascinated with the ending. I am reading the Gideon Oliver books in sequence and, finishing this third volume I am getting more interested in Professor Oliver and his adventures. Aaron Elkins blends very detailed archaeological information into his stories and it has taken me a few books to get interested in that discipline. What I have enjoyed is Oliver's friendship with his retired mentor and professor, Abe. Their relationship is warm and real and adds some texture to the book and relief from the drier technical aspects o I am reading the Gideon Oliver books in sequence and, finishing this third volume I am getting more interested in Professor Oliver and his adventures. Aaron Elkins blends very detailed archaeological information into his stories and it has taken me a few books to get interested in that discipline. What I have enjoyed is Oliver's friendship with his retired mentor and professor, Abe. Their relationship is warm and real and adds some texture to the book and relief from the drier technical aspects of Elkin's writing. On his honeymoon with wife Julie in Charmouth, England, Dr. Gideon Oliver gets pulled into a dig that is causing controversy, and raising skeptical eyebrows among archaeology professionals. And when a murder occurs, Gideon finds himself working with a local detective on the investigation. A good story, and continued development of the characters, and their relationships. Gideon and Julie are honeymooning in England and get mixed up in fraud and murder at a dig in Wessex. This was not nearly as good as The Dark Place ... Julie seems to have disappeared as an interesting character. Maybe things will improve if she returns to the Park Service. Yes I enjoyed it. Nice light read. Good suspense, good mystery, fun thriller. The book itself seems to have been dashed together--lots of editing errors and typos. But overall, a decent read. Had no idea about the full extent archaeological significance of England....but I do now! A whodunit with facts and history...what more do you need? The more I read of this series, the more I like it. Always interesting and intriguing, the stories are also instructive. On to the next one in the series! It was short and somewhat entertaining but most of the book involved descriptions of scenery and food and not much involved the actual mystery. Not sure I would choose to read another of the series although the central characters seemed to be interesting people. It isn't often that archaeologists turn up intact bodies, and fresh ones at that. This group, however, is a collection of misfits, making all eligible for murderer or murdered. A bit too much obvious foreshadowing. The vicious dog. The "oh, we're going out to the meadow at this exact time." I bet you can't imagine what happened. Enjoyable, but slower paced than The Dark Place. It kept that slower pace throughout the book. We don't even find out there's been a murder until a third of the way through the book. There's some pretty heavy foreshadowing going on in this one. At times if felt like the author was hanging out neon signs 'Here Be A Clue! ', 'this is important and will play prominently later'. One of the things that bothered me a little was identification of the body. The hole in the elbow from the wear and tear of Enjoyable, but slower paced than The Dark Place. It kept that slower pace throughout the book. We don't even find out there's been a murder until a third of the way through the book. There's some pretty heavy foreshadowing going on in this one. At times if felt like the author was hanging out neon signs 'Here Be A Clue! ', 'this is important and will play prominently later'. One of the things that bothered me a little was identification of the body. The hole in the elbow from the wear and tear of pitching is found in the right fossa. But the individual was a lefty (southpaw). That should mean the extra wear and tear is in the left elbow as that is where all the stress is located. Some of the distances and geography didn't seem quite right either, but that might have just been artistic license. Julie didn't have as big a role in this story, even though she was around for the entire thing. Abe, while only being there for half the book had about the same amount of activity as the previous story. Unfortunately there was no John Lau this time. Outside of Inspector Bagshawe Dr. Merrill I don't think there was a sympathetic character in the story. They all struck me as pretty big douches. Well, Hinshore the innkeeper wasn't bad either. There is always a different setting, and this time it's the English coast along the Channel. While it doesn't sound horrible, it doesn't seem like someplace I would ever seek out as a vacation spot. 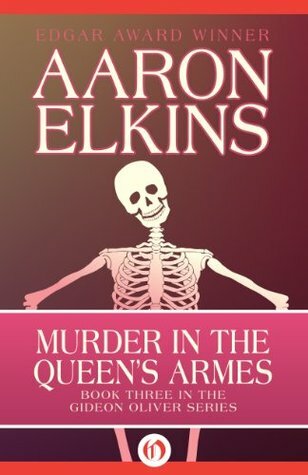 Murder in the Queen's Armes by Aaron Elkins. Gideon and his new bride are on their honeymoon in England. It's the happiest Gideon's been in many years and they both intend to make the most of their newly found bliss. A museum they visit has been robbed of a priceless artifact. A part of a skull has gone missing from its exhibit. The how and why this skull fragment would be missing is perplexing to Gideon. Gideon decides to pay a visit to a former acquaintance of his, Nate. Nate is currently in ch Murder in the Queen's Armes by Aaron Elkins. Gideon decides to pay a visit to a former acquaintance of his, Nate. Nate is currently in charge of an archeological dig. But when Gideon and Julie meet up with Nate they find his over the top excitement to be in the very least unwarranted. It seems Nate has decided to take a major turn in the wrong direction regarding this dig. Before long there's a murder to be solved and the victim is one of the members of Nate's dig. Then Gideon's former prof/mentor and long time friend Abe Goldstein enters the picture. Soon they are all involved in Nate's dilemma and in solving this murder. This was one of the best in the Gideon Oliver series. The characters are believably real and their dialogue kept me focused on the mystery. Elkins takes Dr. Oliver back over the Pond, through rural England, on his honeymoon. A controversial dig site raises many questions about the type of archeological finds scattered around England. When one of the students is found murdered, Oliver uses his skeletal expertise to piece some things together, both to identify the murderer and their motive. Oliver introduces his new wife to the wonders of English geography, culinary treats, and warm citizens, all while the investigation continues and Elkins takes Dr. Oliver back over the Pond, through rural England, on his honeymoon. A controversial dig site raises many questions about the type of archeological finds scattered around England. When one of the students is found murdered, Oliver uses his skeletal expertise to piece some things together, both to identify the murderer and their motive. Oliver introduces his new wife to the wonders of English geography, culinary treats, and warm citizens, all while the investigation continues and the suspect list grows. The death of one of the suspects turns the investigation on its head and leaves Oliver to wonder what the larger rationale might be. Elkins presents an interesting story, back in Europe again. Using his vast background in anthropology and human anatomy, Elkins treats the reader to an educational experience while also keeping the story as entertaining as possible. Elkin writes with such ease that the reader cannot help but want to learn more with each passing chapter. Kudos Dr. Elkins for such an interesting piece of work. I am eager to see what follows in this series! We find Professor Gideon Oliver on his honeymoon, attempting to enjoy some quality time with Julie. As they travel around England, he stops in to visit a friend on his 'dig' and soon finds himself involved in the death of one of the graduation students working there. Unfortunately, his friend, Nate--who is in charge of the site--has a terribly abrasive personality, and no one likes him a bit. He has a lot to gain by the disappearance/death of the student. Of course he didn't do it, but trying to We find Professor Gideon Oliver on his honeymoon, attempting to enjoy some quality time with Julie. As they travel around England, he stops in to visit a friend on his 'dig' and soon finds himself involved in the death of one of the graduation students working there. Unfortunately, his friend, Nate--who is in charge of the site--has a terribly abrasive personality, and no one likes him a bit. He has a lot to gain by the disappearance/death of the student. Of course he didn't do it, but trying to sort out which of the very annoying suspects did do it is hampered by the fact the Nate isn't following proper protocol on the dig, and he may be cutting scholarly corners to serve his own purpose. Good plot; there are lots of red herrings and even a possible multiple suspect moment. There are not a lot likable character in the book. The locals are ok, by and large, and of course, Gideon and Julie are refreshingly normal (they even have an argument which isn't silly, it's quite a normal honeymoon fight). Really like Aaron Oliver's character. Happy I have more to read in the series. Anthropology professor Gideon Oliver is honeymooning with his new wife, Julie. His plans go awry when he visits a museum in Dorchester and discovers that someone has stolen prehistoric partial human skull. The honeymoon is effectively over when a casual stop at an old friend's archaeology dig places him in the middle of murderous rivalry and death. This is a well-plotted story, and told simply enough that even I could understand the technical bits dealing with archaeology, skeletons and the like. Anthropology professor Gideon Oliver is honeymooning with his new wife, Julie. His plans go awry when he visits a museum in Dorchester and discovers that someone has stolen prehistoric partial human skull. The honeymoon is effectively over when a casual stop at an old friend's archaeology dig places him in the middle of murderous rivalry and death. I really enjoy this series. This one's set in a British dig, with lots of controversy about finders of early man in Britain. I enjoy the sympathetic characters and positive overall view, and enjoyed the puzzle/mystery (which, involving murder, shows the most negative of human behaviors and motives). These mysteries often include hints at sensuality, usually more cute than offensive, but not always strictly moral. good fluffy mystery. tho the "surprising" twists weren't so surprising, the characters were enjoyable to read about, and archeology is always interesting. i wouldn't be surprised if earlier installments of the Gideon Oliver series were a little better on the mystery side; i got the sense that this was an author who might have been running out of nifty plots. While on his honeymoon with new bride Julie, Gideon finds himself embroiled in a murder set on an archaeological site in Dorchester, England. The plot involves some of Gideon’s previous acquaintances and gives the author the opportunity to use some of his interesting and unique character descriptions. Aaron J. Elkins AKA Aaron Elkins (born Brooklyn July 24, 1935) is an American mystery writer. He is best known for his series of novels featuring forensic anthropologist Gideon Oliver—the 'skeleton detective'. The fourth Oliver book, Old Bones, received the 1988 Edgar Award for Best Novel. As Oliver is a world-renowned authority, he travels around the world and each book is set in a different and Aaron J. Elkins AKA Aaron Elkins (born Brooklyn July 24, 1935) is an American mystery writer. He is best known for his series of novels featuring forensic anthropologist Gideon Oliver—the 'skeleton detective'. The fourth Oliver book, Old Bones, received the 1988 Edgar Award for Best Novel. As Oliver is a world-renowned authority, he travels around the world and each book is set in a different and often exotic locale. In another series, the protagonist is museum curator Chris Norgren, an expert in Northern Renaissance art. One of his stand-alone thrillers, Loot deals with art stolen by the Nazis and introduces protagonist Dr. Benjamin Revere. With his wife, Charlotte Elkins, he has also co-written a series of golf mysteries about LPGA member Lee Ofsted. They shared an Agatha Award for their short story "Nice Gorilla". Aaron and Charlotte live on the Olympic Peninsula in Washington State.